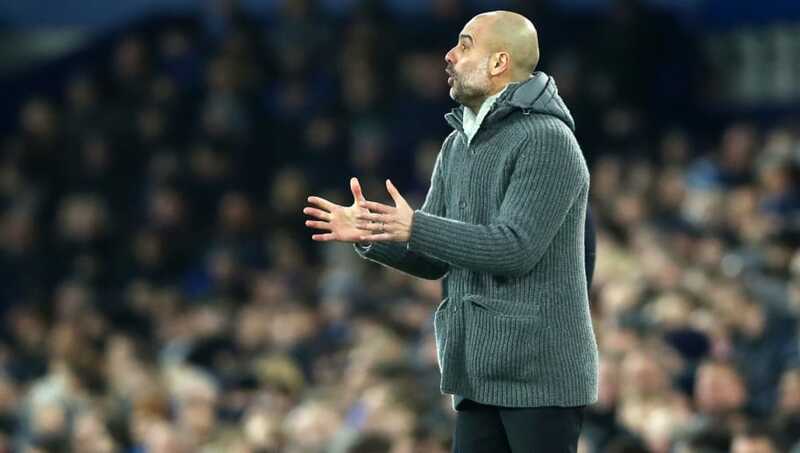 ​Manchester City boss Pep Guardiola saw his side return to the top of the Premier League on Wednesday night, as goals from Aymeric Laporte and Gabriel Jesus ensured all three points went to the Citizens. Though City displayed few characteristics of a typical Guardiola side in midweek, the result meant the Sky Blues are the first to reach 20 wins in the Premier League this season and have put the ball back in Liverpool's court ahead of this weekend's crop of fixtures. With ​City set to play five more games before the end of the month, Guardiola was quick to highlight the importance of Wednesday's win and has hailed his team's mentality amid their recent hectic run. PEP  It was a good game and to score in the last minute of the first half helped us a lot. “Goodison Park is always so tough and in general I am so satisfied,” Guardiola told ​City's official website. “During the last three months every three days it has been game, game, game. In three or four days we now have another one against ​Chelsea. "I don’t know how far we will get but we will try to prepare game by game. “We could have gone seven points behind a few days ago... now we are first. That is a good lesson to never give up. “We have one more game than Liverpool and if they win we are not top. But being top is much better but Liverpool has to play this game. Man City's next test comes in the shape of a Chelsea side who have got the better of Guardiola's men once already this term. In the dress rehearsal of this month's Carabao Cup final, City will look to remain on top of the pile, albeit it being on account of their superior goal difference.